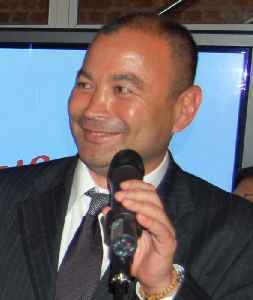 Eddie Jones is an Australian rugby union coach and former player, who has been the head coach of the England national team since 2015. He previously coached Australia between 2001 and 2005, taking the team to the 2003 Rugby World Cup Final. He was an assistant coach for South Africa when the Springboks won the 2007 Rugby World Cup, and from 2012 to 2015 he coached Japan, leading them in the 2015 Rugby World Cup and their upset win over South Africa.